I know it’s hard to think about your winter wedding when it’s almost 90 degrees outside. I get it, I’m literally sitting directly in front of my air conditioner as I write this. That being said, we’re always thinking at least 4-6 months ahead here so this actually makes perfect sense. If you’re planning a winter wedding, it’s time to kick things into high gear because that chilly weather will be here before we know it. 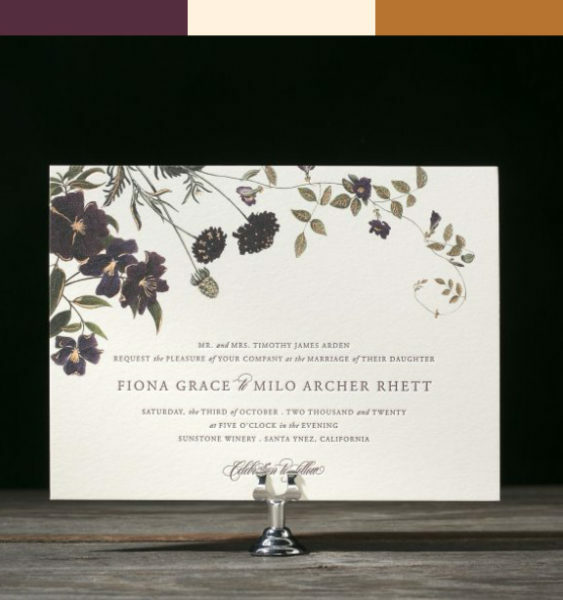 I’ve put together some of our favorite winter wedding color palettes to get you in the mood. I’ve been hearing the word “neutral” a lot lately and as much as I love pastels and bright colors alike, gray is really refreshing sometimes. 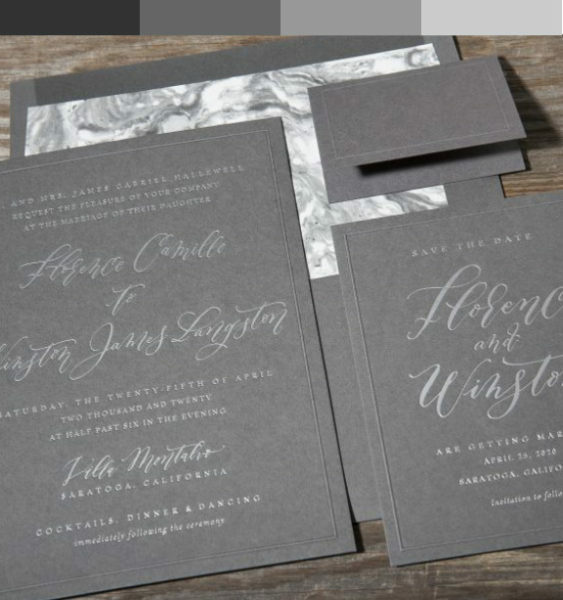 Shades of gray (side-note that book makes me rethink writing, “shades of gray” every single time) are a more modern take on your classic black and white. Love gray but still looking for a more layered look? Try mixing in metals on the big day. There are so many opportunities — jewelry, flatware, vases, the list goes on. Speaking of the good old classic black and white, if you have a power struggle going on in your head between classic and modern, I have a suggestion for you. Keep your color palette back and white but add unexpected twists. 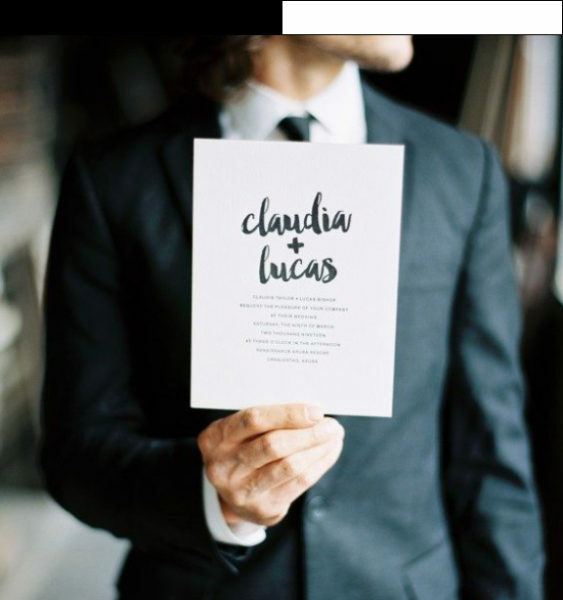 When it comes to save the date and invitation land, your choice of fonts can make a big difference here (don’t worry, we’ll help you). 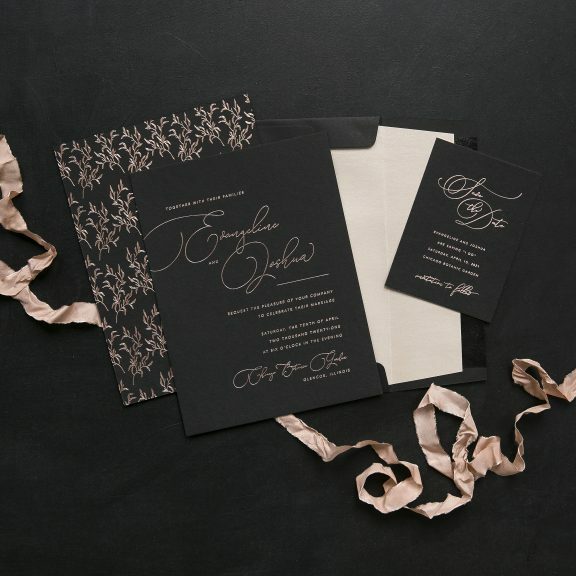 Pairing a black and white invitation with more whimsical fonts immediately gives you an extra splash of personality — neither boring nor outlandish. We know that wine and emerald aren’t a surprise when it comes to wintery colors, but adding rose gold to the mix? We love that idea! So soft and pretty. Seriously, we’re thoroughly obsessed. 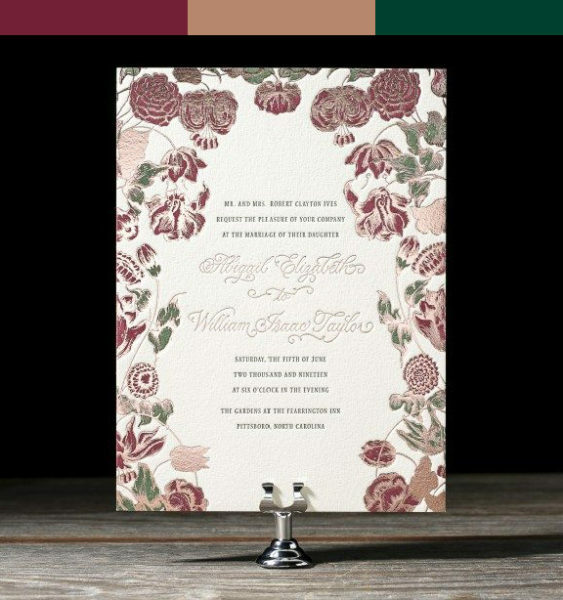 “Arden” proves that floral invitations are completely appropriate for fall and winter weddings. We’ve been in love from the moment this one arrived in our studios. Imagine pretty eggplant bridesmaid dresses with delicate copper jewelry and deep purple centerpieces with copper foil menus — perfection! If our darling Fat Cat mascot had a formal winter wedding, this invitation would be a contender for sure! 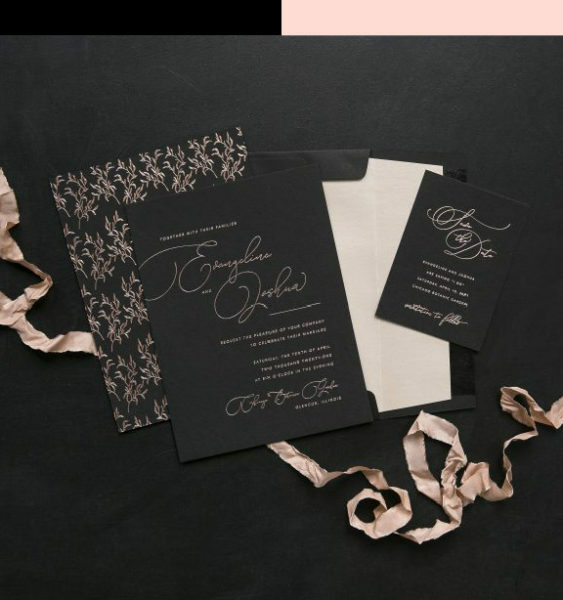 I really just adore how that shiny blush foil pops off of the black background. And that calligraphy-style font — I can’t even. If you’re brave enough to go for a black invitation, pretty please pick this one. Wanna see these letterpress Bella Figura beauties in person? Make an appointment to visit one of our studios. And don’t worry, if you live out of town or have a crazy schedule, you can always book a video conference. We’ll chat about your style and then send a curated box of samples straight to your door!